My #LGSweatSessionSelfie – this combination of foundational weight training movements and bodyweight plyometrics is my favorite for achieving a fit, yet lean look! Motivation Monday: Each day has the potential to be a positive, great one despite what the world gives you. A powerful way to get your day started on a positive note is through a mantra or affirmation. A mantra or affirmation is a short phrase or sentence that helps remind you of how to focus your energy on the positive and exude the negative. Some people like to come up with one personal mantra that they repeat throughout the day while others prefer to use a plethora of mantras for particular situations. Either way, be sure the mantras you select speak to you and can help shift your thinking! You may be wondering how this can help you reach your health and fitness goals. The truth is, the majority of healthy living is a mental game…it requires willpower, discipline, and inner strength to consistently choose health food options over junk, to get yourself to the gym each day, and to put in the effort even when you don’t feel as though it’s paying off. If we can better master our mind over the next 5 weeks, we can accomplish what we set out to do! Let’s get our minds right! Day 2 Challenge: Pick a mantra(s) and post it! You can create a wallpaper for you phone or computer. You can write on post-its and stick them around your home and car. Write them out/Print them/Post them! Then show us your mantra on your check in! Stay accountable! Upload your workout, meal and challenge pictures to Instagram to inspire and be inspired by the community. Use the hashtags #LGFitmas #LGAccountability, and/or #LGSweatSeshSelfie and tag me, @laurengleisberg so we can all connect! Happy 1st day of #LGFitmas!!!! Day 1 Challenge: Let the progress pictures begin! A “before” picture is not necessarily fun, but you’ll thank yourself later! In a tight fitting outfit or in a sports bra and shorts, take 3 pictures: from the front, side, and back. Over the next 5 weeks, we will be able to put these progress pictures side by side to track changes in our body composition! On Instagram, share a picture of yourself (it can be your progress pic or anyone of yourself) and a share bit about who you are and what you want to accomplish…let’s get to know each other on a personal level! It’s going to be pretty amazing to work through a plan with so many other people at the same time, so be sure you’re checking in on Instagram and using the hashtag #LGFitmas & tag me @laurengleisberg so we can all connect! I’m so excited to spend the next five weeks with you… getting fit, staying healthy, and feeling happy all while enjoying the holidays! season without any guilt over celebrating! What are the Five Weeks of #LGFITMAS? Daily workout posts will be made to my blog Monday-Friday; 5 workouts per week will ensure you’re staying active and getting fit throughout the holiday season! These workouts will also be pinned to my #LGFITMAS Pinterest board, so you can see them all in one place and pin them to your own boards! I’ve already created the board, so be sure you go quickly follow my account (here). I also love to pin motivational quotes & holiday decor. Engaging themed tips to stay motivated and excited each day will also be found on my blog! To stay connected and accountable, we will use social media check ins on Instagram to work through this plan together! Ideas for picture uploads include, but are not limited to meals, recipes, workout selfies, completed challenges, holiday pics, etc. On Instagram, be sure to use the hashtag #LGFITMAS so I can see/like your pictures as well as the entire community! Feel free to peruse the hashtag as well for inspiration from all the other ladies working through the plan! Invite your friends, family, co-workers, etc….anyone who will further help keep you motivated! At the end of the 5 weeks, transformation pictures may be submitted to me via email; winners will be chosen by me based on overall dedication to the program through check ins, willingness to help and inspire others, and personal progress. The top 3 winners will each receive a $30 gift card of your choice to either Nike, Lululemon, Sports Authority or Dicks Sporting Goods. You may be wondering by now, “what is the cost?” Happy holidays, my lovebugs! This is my gift to YOU for the crazy amount of love and support you share with me and my blog! tag me, @laurengleisberg so we can all connect! Tip of the Day: So, you say you want abs, right?! Are you taking the right approach? One of the top physical goals of women I work with is to achieve visible abdominal definition ((ps – it will forever remain my goal too; just because I have them now, doesn’t mean I can stop working at maintaining them)). Just like building a home requires a blueprint configured around your desired home design, building your dream body, requires a carefully constructed plan based on your desired look. Personally, I find developed oblique muscles to be a great first target for someone wishing to achieve abdominal definition as they are superficial muscles (close to the skin), so they are “easier” to make appear. The external obliques are the muscles located on the lateral sides of the abdomen region; they function to allow the body to bend from side to side and twist the torso. Not just any abdominal movement targets the obliques best, so, if you’d like to take the approach that I do with training obliques, pick exercises, such as the ones I used in today’s workout! As of late, my abdominal training mostly consists of overall core (planks on planks) and some isolating oblique exercises. As an added bonus, I’ve found that by developing these muscles, they activate a lot easier in other movements! I’m pretty happy with how this recent training style has helped give my abdominal section a fit, yet feminine look! Tip of the Day: Fat loss versus maintenance – is there a difference in the approach? A famous 1959 Yale University study that health and fitness experts often refer back to concluded that 95% of individuals who lose weight, regain it within months to years. Since then, many studies have attempted to prove this percentage is not so large, but yo-yo dieting ((aka ups and downs in weight fluctuation)) is quite evident in society; I would guess 95% of us either know someone who is a yo-yo dieter or personally have gone through yo-yo deiting. “Lauren, what are you getting at other than trying to depress us? !” Sorry ladies…I’m almost there! Yesterday, on Instagram, you may have seen me post the below picture with the caption “Dear Fat, Prepare to die! 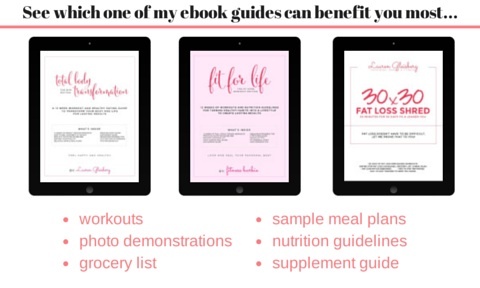 XO, Me.” The response to that picture was, in other words, “what fat do you have to lose.” Enter…fat loss versus maintenance and the above study results. Clearly, weight/fat loss is not the end result. I, just like any of you, who have worked to achieve a body that may be considered a “physical goal” known that it cannot be sustained without the same amount of work it took to get there; those who make this mistake may risk being placed into the yo-yo weight gain and loss category. In health and fitness, a physical goal is not something you can simply check off; it requires a great deal of work to simply stay in the same spot, so before you beat yourself up for not making forward progress, pat yourself on the back for not taking steps backwards! As soon as you hit a goal, set a new one. This will keep you motivated to continuing to work hard. Believe it or not, a large part of fat loss comes down to hormones. I’m sure you can think of a lot of ways outside of fat loss that imbalances in hormones can cause your body to get out of whack ((PMS, anyone?!)) Things like binge eating and, on the contrary, periods of food deprivation can be detrimental the hormones responsible for fat loss. The best approach to any healthy lifestyle is one that is balanced ((not too restrictive and not too relaxed)). Even while losing fat, it’s okay to enjoy a treat ((not twenty)) on occasion and workout for an hour ((not three)). Tip of the Day: I think it’s safe to say cold and flu season is upon us; I have a pretty strong immune system, so when I began sneezing this weekend, I knew I had to act fast! I think the key to limiting the duration of any bug is how you handle it, especially in the first day or two! Today, I’m sharing a juice recipe that gave my immune system a kick and had me feeling better in 24 hours! Even if you’re feeling grand, this juice will surely give you a boost of energy; I think I’m going to add it to my regular recipe index! Apple – apples are just about the only non-citrus fruit that I will juice; if you’re new to juicing and fearful your juice will taste like grass, add an apple for a perfect amount of natural sweetness. Aside from the taste benefits, apples contain many nutrients and phytonutrients, especially in the skin and just under the skin ((so be sure to leave the skin on when you juice)). Also, apples contain high levels of Vitamin C for an immune system boost! Lemon – lemons are very effecting at combating infections as it contains antibacterial properties and vitamin C to support the body’s defenses; for a sore throat, you may even want to gurgle lemon water or lemon and honey water. Ginger – ginger can improve the absorption and assimilation of essential nutrients in the body. It also helps clear up certain channels in the body, such as the sinuses. Cheers to a cold-and-flue-free winter and holiday season thanks to this drink! Tip of the Day: Keep your weekend moving in the right direction by staying active. On the weekends is when I ((and many of you have shared)) is the most difficult time to eat healthy. It’s easy to get caught up in the binge/guilt food trap. Try to shift you’re thinking and direction to what you can do “right” on the weekends. For instance, if you’re someone who loves to have fun and make plans…stay active socially; sign up for a fun run with your girlfriends, track your steps while walking around the mall, or take the kids to a trampoline park! There are so many ways to get in a “workout” without going to the gym, especially on the weekends. Those who can learn to make healthy living fun often have the most success with sustaining lasting results! Have a wonderful weekend, y’all! #LGAccountability Daily Challenge:It’s that time again…I want to see YOUR flex friday picture! team hashtag and tag me @laurengleisberg so I can see them too! 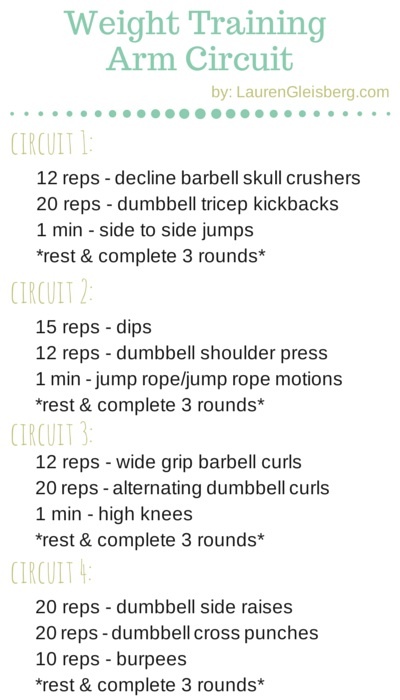 Tip of the Day: Go for a simple switch up, such as dumbbells versus barbells versus kettlebells versus cables. I speak a lotttt about switch ups with workouts ((probably so much that you’re expecting another switch up rant)). Seriously though…there are so many “easy” ways to keep progress moving forward and simple switch ups are one of them. For instance, take a movement from today’s workout: a shoulder press. In today’s workouts, I suggested performing the exercise with a set of dumbbells, but you could also use a barbell, a resistance band, a cable, etc. The equipment used with the same exercise does, in fact, change how the muscles and body carries out the movement; dumbbells will allow for more unilateral movement whereas a barbell will change the movement due to the nature of the fixed grip. If you’re looking for a very easy way to push through a plateau or work on progressing physically, a simple switch up like this is a great go-to! In the words of Nike, “just do it.” I’ve slipped into a bad habit lately of opening my inbox and diving into tasks before my workout, knowing I won’t be able finish in that allotted time. It does nothing but distract me from getting pumped up to go to the gym in the morning. I needed these pants today to remind me despite all the “to-dos” on my list, my workout was important…so…just do it!